USS Skipjack was a nuclear powered attack submarine used by the United States Navy. She was the lead boat in her class and built in 1956. She had a series of firsts including the first nuclear powered vessel to pass though the Straits of Gibraltar. The model is based on the Revell 1/72 scale kit but has been heavily modified to allow her to submerse and sail like a submarine. She has a watertight tube containing all the radio equipment and motors which control her. Trying to photograph her is difficult in the water! The boat is a work in progress development idea. I wanted to make an air boat that was a bit different, so I purchased 2 brush-less ducted fan units that are designed to be used in model jet aircraft. For further details and photos please click here. These are a small multi-racing boat of only 515 mm in length. The kit you buy is complete with 550 motor, prop shaft, rudder etc, except for radio gear and battery. These are fun boats, when there are a few boats racing together. Here is a Kyosho Blue Streak, it's fitted with an unknown motor, 20amp ESC, 2.4ghz radio, and is pictured running on a 7.2V battery pack, though it should really be running on 9.6V. It's got a good speed to it and a tight turning circle. It's a bit worse for wear at the moment and is undergoing a bit of an upgrade. This is my novelty build. It's a giant rubber bath duck, that I cut open and fitted a Graupner speed 500 Race motor, coupled to a graupner 'hydro propulsion system', providing both power and steering. Due to the limited space inside the duck, a special split-cell battery pack had to be made so the batteries could sit either side of the prop shaft. 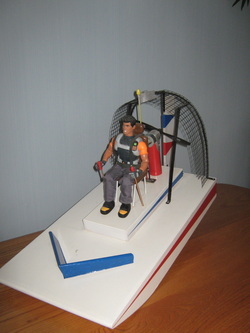 An Airboat, built to my own design, complete with a talking Action man.